Managing software projects is difficult under the best circumstances. The project manager must balance competing stakeholder interests against the constraints of limited resources and time, everchanging technologies and challenging demands from high-pressure people. Project management is a juggling act, with too many balls in the air at once. Unfortunately, many new project managers receive little training in how to do the job. 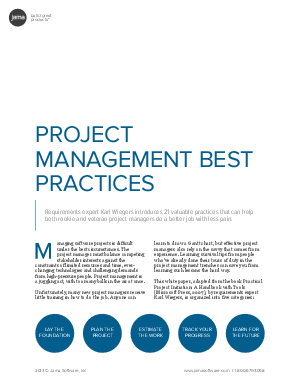 Anyone can learn to draw a Gantt chart, but effective project managers also rely on the savvy that comes from experience. Learning survival tips from people who’ve already done their tours of duty in the project management trenches can save you from learning such lessons the hard way.